In today’s world, everything needs to be mobile, portable and “on-the-go”. And that includes the sign bases that everyday employees and public workers use on a day-to-day basis. That’s where we have you covered. 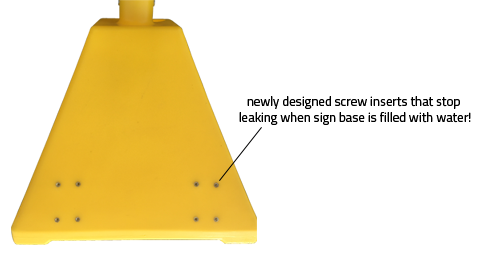 Ideal Shield’s portable sign bases have always been a leading product in the industry, and now they’ve been redesigned to function even better. We’ve added pre-installed inserts which ensure a leak-proof sign base once water is added to stabilize it. Watch this quick video and see for yourself how easy it is to install and transport these lightweight, maintenance-free, portable sign bases for use anywhere. You can’t do that with a concrete sign base! Ideal Shield manufactures easy-to-use, maintenance-free products to make your life easy.